Turnberry Ailsa Hole 1: The first hole of the day is arguably the easiest as long as the fairway bunkers can be avoided (easier said then done as there are plenty on both sides. Turnberry Ailsa Hole 4: The first par three of the day is not particularly long or difficult, but it does have a nice view of the Irish Sea and the dunes along the beach. Turnberry Ailsa Hole 5: This slight dogleg left par four requires a perfect drive between the sets of fairway bunkers and the best approach to the green is set up differently based on where the pin is. 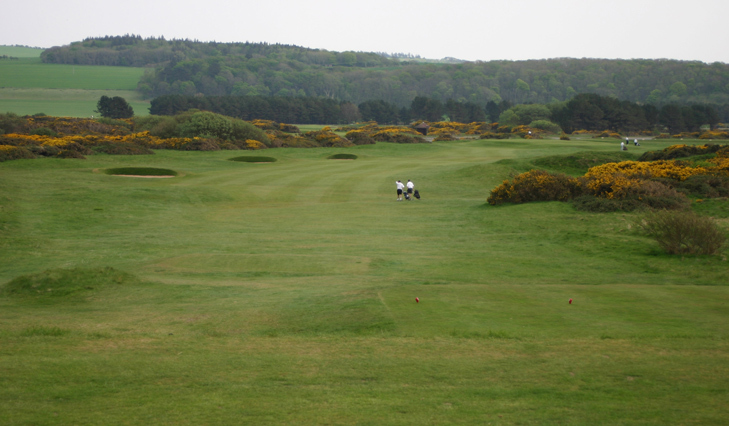 The green is also well-bunkered by traps both seen and unseen from the fairway. 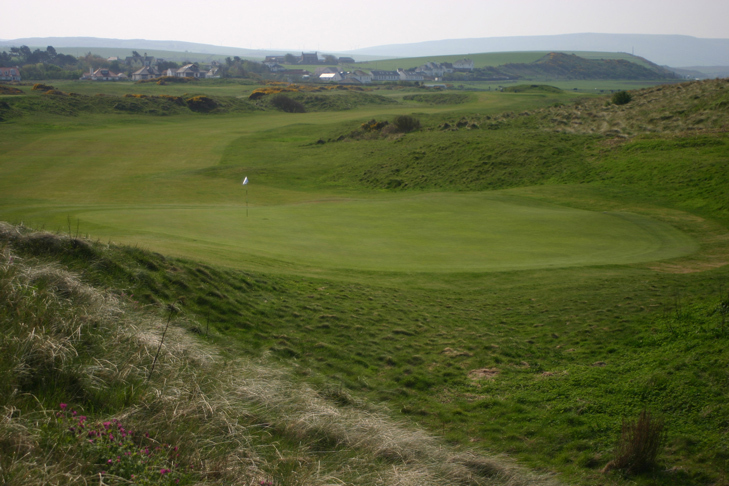 The dunes to the left of the hole and behind complete the great setting for the tough hole. 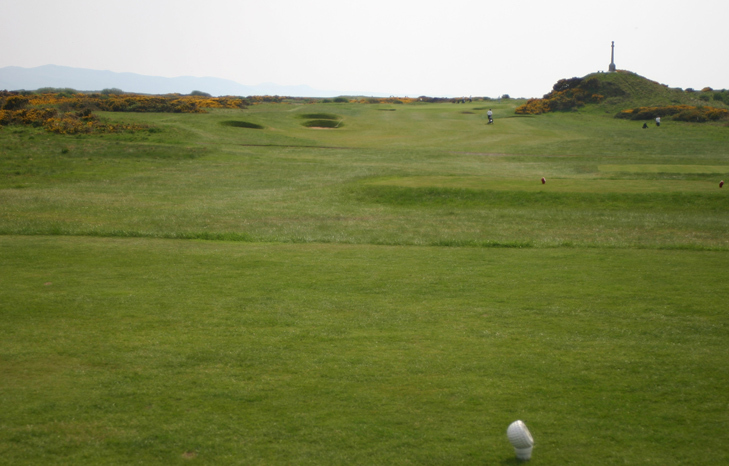 Turnberry Ailsa Hole 7: One of only two par fives from the back tees, this is a dogleg left. The key to making a birdie lies in the aggressive drive that successfully negotiates the bunker on the inside of the corner without finding it or the nasty rough around it. 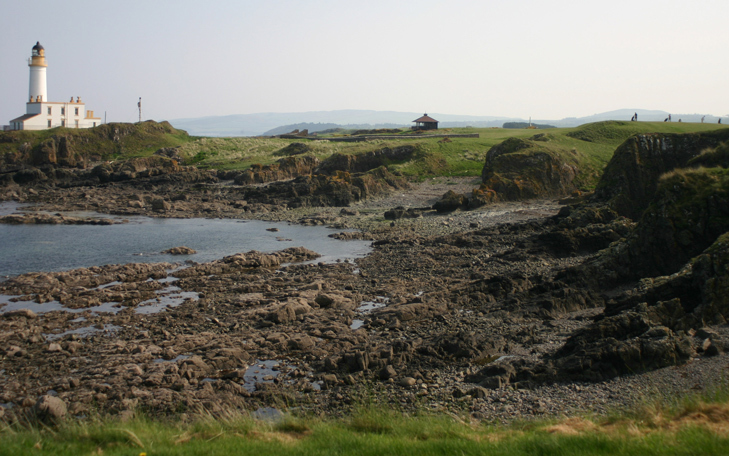 Turnberry Ailsa Hole 9: This brutal par four is famous for its drive over the cove (yes, this is what the tee shot looks like at low tide, from the back tees, see golfers at right side), under the watch of the Turnberry lighthouse. The fairway is at an angle to the tee box and is crowned and undulating. Thus, only the best drive will leave an approach from the short grass. The green is uphill and guarded by bunkers and humps that make it difficult to hold. Also, playing at different tides gives the player completely different looks from the tee, all awesome. 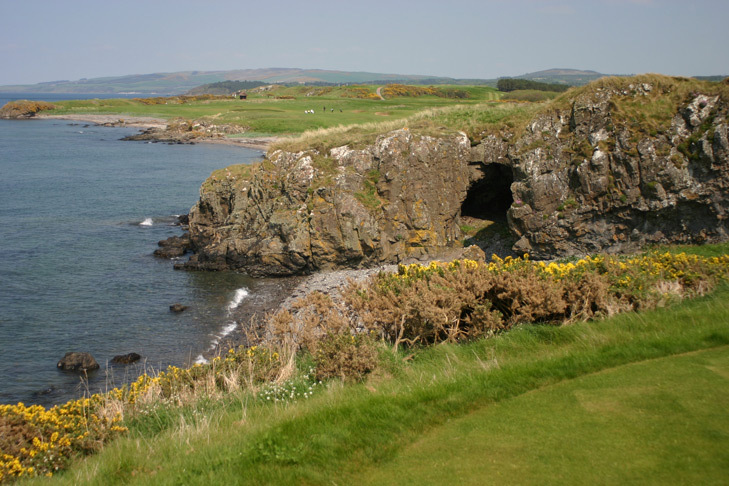 Turnberry Ailsa Hole 10: Another brilliant tee shot over a cove (and close to the former residence of Robert the Bruce) faces the player on this great par four. The bunkers recently placed in the middle of the split fairway make yet another tough hole even trickier. The approach must then avoid the massive bunker 30 yards short of the green, but is otherwise quite accessible. Turnberry Ailsa Hole 12: Named after the World War II "Monument" to the right of the hole, this rather simple hole (although long) on paper has brilliantly designed bunkers that seem to know where the ball is going and call it into their depths, even when the player thinks they might be safe..
Turnberry Ailsa Hole 13: The best green complex on the golf course does not feature a bunker and is found on this long par four. 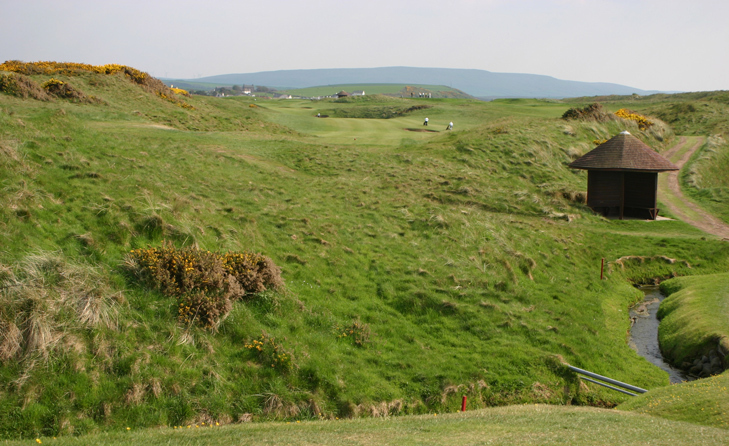 The drive must once again avoid bunkers left and right, as well as the gorse bushes that frequent the inland holes. 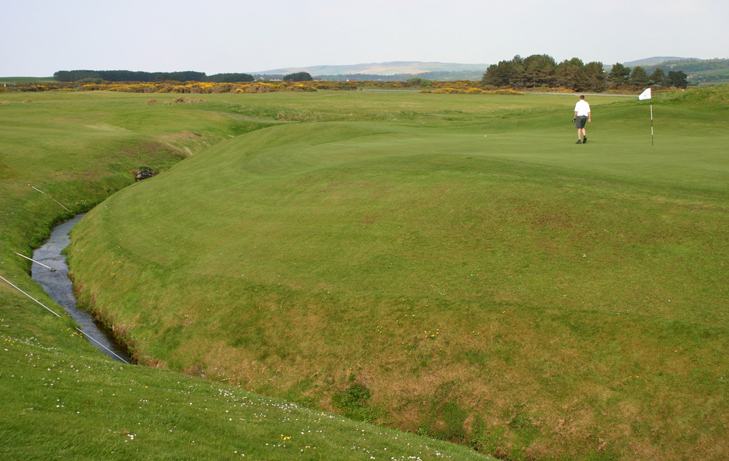 The green is raised above its surrounding areas and features several shelves that must be either hit with a high shot, subjecting it to the Scottish wind, or a pitch and run shot that, if not metered perfectly, will leave a chip from short or long of the green back up the hill, which is not easy. Turnberry Ailsa Hole 16: The most diabolical hole on the course is #16, which features the only real water hazard, the “Wee Burn”. This term is a misnomer as, although the water is only 5 feet wide at most, the severe slopes on either side of it make the hazard at least 30 yards wide. What makes it even more tricky is that a shot left 1 foot short or right of the green will find the hazard every time. The bunker left of the green will also make the sand shot very scary as well knowing what awaits a shot that goes too far. Turnberry Ailsa Hole 17: The only par five on the back nine is usually into the wind and has loads of trouble down the left side. However, two long, straight shots can lead to a rare scoring opportunity. 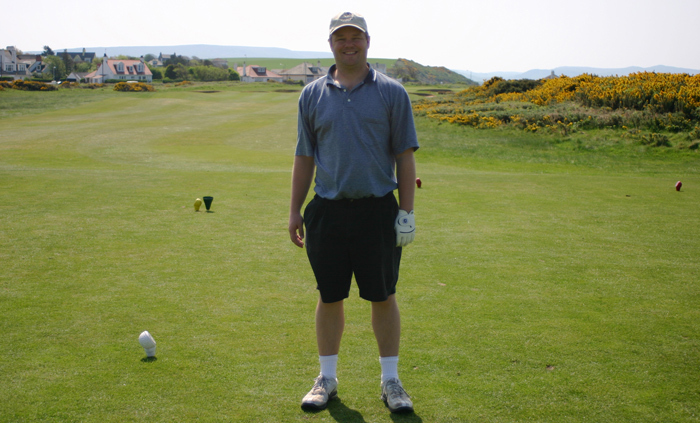 Read the Turnberry Kintyre Course Review.